Fifty percent of the world’s population is under the age of 30. This is the highest youth population in history, and the latest World Economic Forum Global Shapers Survey (covering more than 30,000 individuals under 30 from 186 countries) tells us what today’s young leaders think about our world and their place in it. So, what are the essential insights we should be acting on in 2018? Firstly, the millennial generation views climate change and conflict as the most critical issues we face. Secondly, they regard a “start-up ecosystem and entrepreneurship” as the most important factor contributing to youth empowerment in a country. 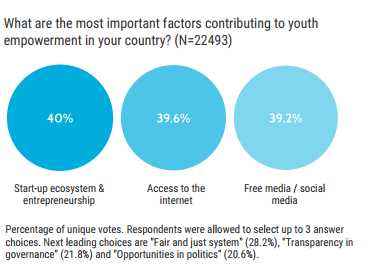 In addition to these priorities, young people feel their voice is not being heard, as 55.9% of respondents to the survey disagreed with the statement: “In my country, young people’s views are considered before important decisions are taken”. How can we address some of those pressing concerns while ensuring that our young leaders actually have a say in the decisions that will shape our future? On climate change, it’s clear that rapid implementation of Sustainable Development Goal 13 – “to combat climate change and its impacts” – is a basic prerequisite at the level of national policy-planning. However, deciding what precise actions to take across all levels of society to combat climate change is a more open-ended question. Some would say the technological answers to climate change are already in our hands, but, in the words of the Intergovernmental Panel on Climate Change’s lead author Dr Leon Clark: “We really have no sense of what it would take to deploy them at scale." 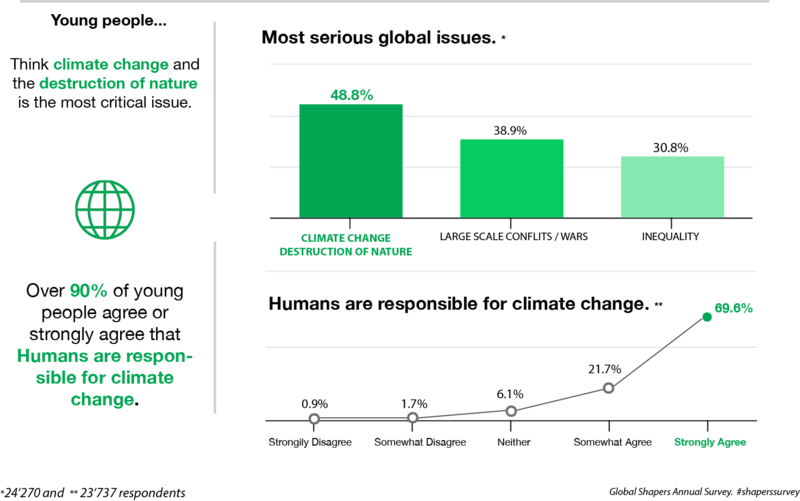 Initiatives such as Project Drawdown provide a useful calculation of the most powerful solutions already in existence, ranked according to estimated CO2 and greenhouse gas reductions. But for the sake of this article, our focus is youth empowerment and its relationship with conflict, the second “most serious global issue” identified in the survey. Let’s start with the question of entrepreneurship. The majority of young people are optimistic about the impact of technology and innovation: 78.6% think technology is “creating jobs” as opposed to “destroying jobs” (21.4%). However, can technology alone address the alarming reality of 71 million unemployed 15-to-24-year-olds around the globe? This is close to a historic peak of 13%, according to the International Labour Organization (ILO)? The current youth unemployment challenge affects countries at all stages of economic development. Latin America faces high and growing youth unemployment rates (higher than 17% in 2017) and the EU-wide rate is currently at a similar level, with figures as high as 35%, 38.7%, and 43.3% in Italy, Spain and Greece. As I noted at last year’s World Economic Forum on Latin America, unleashing the potential of entrepreneurship is not simple. When taking action to cut red tape, remove structural barriers or alleviate social ones, we must not fall into the trap of a one-size-fits-all approach to innovation. 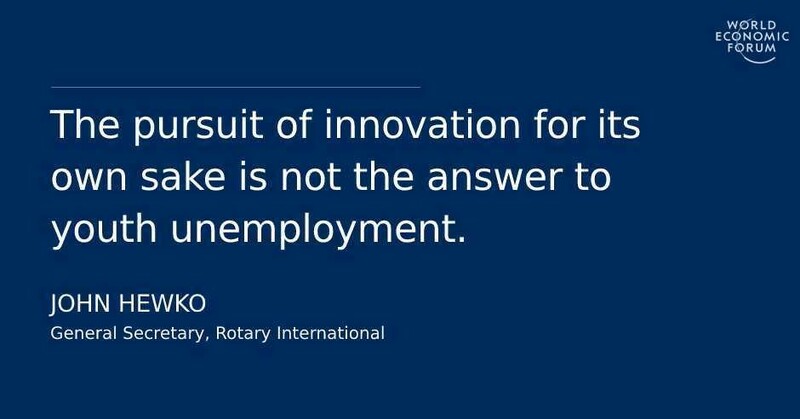 In fact, the pursuit of innovation for its own sake is not the answer to the challenge of youth unemployment. Many projects to stimulate entrepreneurship have failed because they have attempted to replicate the nonpareil of innovation, Silicon Valley. In the words of Stanford Business School lecturer Federico Antoni “no government programme, no internal market will create a new Silicon Valley”. Even those who consistently back successful start-ups in the Valley - which attracts more than one-third of all US venture capital investment – find it hard to pinpoint the reasons for its unparalleled prosperity. Peter Thiel, the entrepreneur who has co-founded or invested in some of the world’s leading companies, such as PayPal and Facebook, is sceptical about attempts to replicate the world’s largest innovation hub: “It is not even clear why Silicon Valley works. It is a singular thing, it is one time, one place… then I always think that once you have set out to copy something you have already put yourself in somewhat of an inferior position”. Even with generous government grants and tax benefits, ambitious attempts to create new tech hubs, such as London’s Tech City, have failed to live up to expectations. To put this in perspective, according to The Spectator: “Facebook, which was founded in 2004, is worth about twice as much as the 40 European unicorns [start-ups valued at a billion dollars or more] put together”. If our mission is to reduce youth unemployment and social conflicts, then a better strategy would play to the strengths of particular regions with solutions tailored to local needs. For example, one World Economic Forum Global Shaper project in Kabul, Afghanistan, attempts to implement sustainable initiatives to benefit unemployed youth at risk of radicalization by groups who seek to take advantage of ongoing security problems. The emphasis is less on pure innovation, but on supporting those who have the skills, but not the financial resources, to launch their own businesses. The funding mechanism is divided into two components, designed to meet the growing demands of each start-up. In-kind grants will fund upfront expenses, while no-interest loans will cover recurring expenses until each start-up becomes self-reliant. By identifying young people with business skills in remote areas who need a leg up, the initiative can provide the type of opportunities that can reduce the allure of militant groups, who in many cases are attractive for purely economic rather than ideological reasons. In addition, projects such as this address not only the challenge of youth unemployment in a local context but also another critical issue identified by the Global Shapers – the refugee crisis. In 2018, the world will continue to struggle with the reality of a record 65 million-plus displaced people in need of shelter, safety, and employment. About half of global refugees are under the age of 18, so our actions to assist them will directly affect our progress on youth empowerment and conflict prevention. Of particular concern is the opportunism of extremist organizations, who are “filling the void in state services for desperate refugees in their country of origin and ‘safe third country’,” according to the first detailed report on Pathways of Youth Fleeing Extremism, by the counter-extremist organization Quilliam. One response to this phenomenon which I cite frequently is the work of Anne Kjaer Riechert, a Danish Rotary peace fellow alumna living in Berlin. Her ReDi School of Digital Integration, founded in February 2016, intervened to meet the needs of two constituencies: the migrants entering Germany who sought gainful employment, and the companies who needed to fill 43,000 open IT-jobs in Germany. The coding school she co-founded, in addition to training offered in entrepreneurship skills, has already supported the emergence of three start-ups. Mutually beneficial economic integration initiatives like ReDi offer a model for the future, as Europe anticipates 756,000 open IT-jobs by 2020. 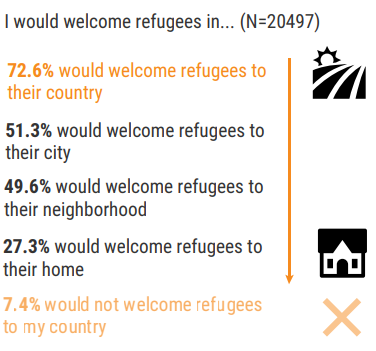 These projects also reflect the attitudes of young people; a majority of millennials (55.4%) believe host countries should “try to include [refugees] in the national workforce”. Our efforts to give millennials what they want in 2018 should be measured against two questions articulated by tomorrow’s leaders. Firstly, does it make a positive social and environmental impact, with inclusive solutions tailored to local needs, and enough opportunities to build resilience in young people against radicalization? Secondly, does it fall into some of the same entrepreneurship and innovation traps which have derailed previous attempts to expand the positive impacts of the Fourth Industrial Revolution? We already have many sustainable solutions at our fingertips – it should be every organization’s challenge to empower the generation who want to make a difference and to do so quickly.